More data and wider application areas. 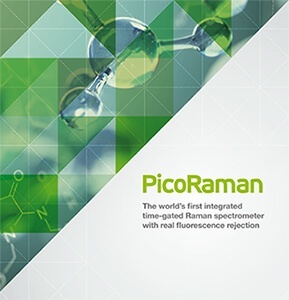 PicoRaman – the first commercial time-gated Raman spectrometer. Raman scattering and fluorescence emission phenomena differ in the time scale. PicoRaman uses Timegated® technology for measuring both phenomena, providing accurate data for material analysis. PicoRaman broadens the possibilities for research and commercial applications. Learn more about time-resolved technology of PicoRaman, and how you can utilize the instrument. Download the brochure by filling in the form. Fill in your contact details and download PicoRaman brochure for more information.